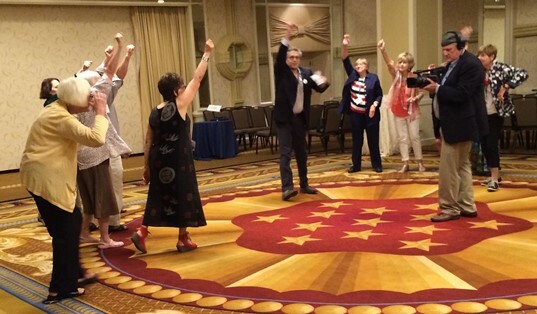 What a buzz there was at the 8th International Positive Aging conference in Washington DC! Connecting with old friends and making new ones. Excellent keynotes: Ashton Applewhite, who is waging a battle against ageism; James Firman, CEO of the National Council on Aging, who gave us seven keys to navigating longer lives; and Roger Landry, whose best seller Live Long, Die Short should be compulsory reading for everyone – regardless of age. 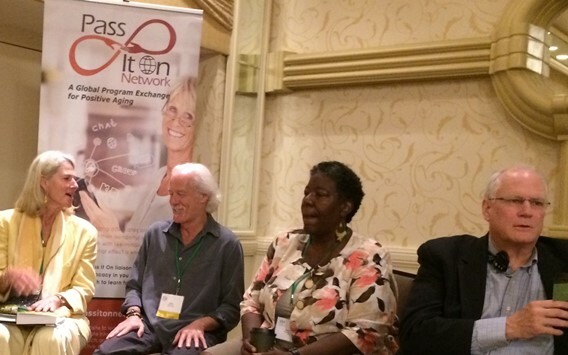 The Pass It On Network workshop presenters, including Dieter Zwicky from Switzerland, Elizabeth Isele, founder of the Global Institute for Experienced Entrepreneurship, and Brian Pratt, founder of Redstring, stirred imagination and enthusiasm. A constant, frustrating menu of workshop choices – first-rate offerings – all going on at the same time… For example, how would you choose between Dr. R. Jack Hansen’s “Shaping a Life of Significance”, Mona Kreaden’s “Transition Network Home Project-A housing Options Journey,” and Connie Reider’s “Wisdom of the Ages – 90 and Beyond”? It wasn’t any easier in the afternoon when the choice was between: Jean Accius, on “Caregiving: Is It Different for Men?”; Renée Rosenberg and Dori Mintze, on “Age is a Mindset: Managing Job Search Attitudes in Older Job Seekers”; and Annamarie Pluhar, “On the Sharing Housing Option – Aging in Place with Company”. A highlight was the Wiser Together World Café with 40 olders and youngers. 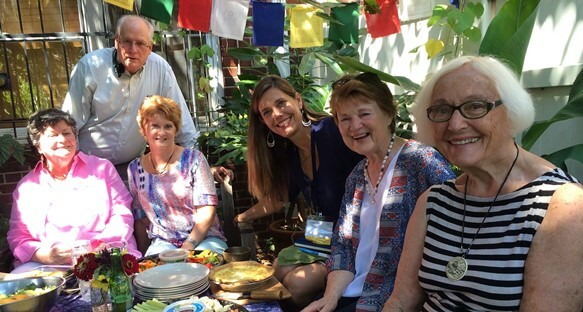 This event was inspired by the 2014 Positive Aging Conference in Sarasota where the World Café finale revealed a strong need and desire to strengthen intergenerational ties. Check back for link to the Harvest Report. For the first time, the Positive Aging Conference was twinned with the Certified Senior Advisors (CSA) conference and all details were masterfully handled by Judy Rough and her team. We have a great deal to be thankful to the CSA for including the full library of handouts you can access here. Bruce Frankel’s movement choir was fun, stimulating and surprisingly liberating. We need more of this! 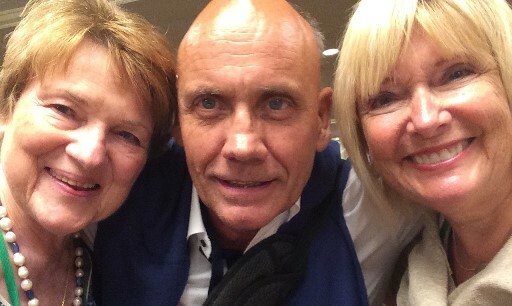 Happy reunion for three Two Young To Retire facilitators, who met at the first Positive Aging Conference in St Petersburg, Florida in 2007: Moira Allan, from France, Dieter Zwicky, from Switzerland and Candy Spitz from the US. Participants at the Pass It On Network workshop included Dr. Fran I. Hamilton whose session on A Monster in the Mind: Finding the Positive in Dementia, attracted much interest, author Gregg Levoy,renowned for his best sellers Vital Signs: Discovering and Sustaining Your Passion for Life (Penguin)and Callings: Finding and Following An Authentic Life (Random House), Rhonda Mayer and Brian Pratt CEO of Redstring. The Pass It On Network core team found time for a brunch where they all met physically for the first time. Working virtually across the globe is a wonderful feat of technology, nothing, however, beats meeting in real life. (L to R) Elizabeth Isele, Pass It On Network advisor, Penne Baer, our web manager, Brian Pratt, CEO of Redstring, the platform powering our new video conferencing facility, Kari Henley our teleconference facilitators, Moira Allan, International coordinator and co-founder of the Pass It on Network with Jan Hively, co-founder and country liaison for the USA. Bruce Frankel, editorial advisor, was taking the photo. Known affectionately to all as « Siva », Sivalingum Subramanien is our new liaison in Mauritius, who will work hand in hand with Amoorgum Parsuamen, our first liaison from Mauritius, who is collaborating in a new Pan-African Project A for Active aging. Siva retired as permanent secretary at the Ministry of Education 15 years ago and was immediately retained as advisor to the vice president of the Republic. He earned a Ph.D. in Aging at 73 and explains his motivation. “At this late age, when life is coming to a close, I intend to be as knowledgeable as possible about the peculiarities of this stage of life so as to make the best of it. I also wish to keep my brain active in order to avoid degeneration. Finally, doing a PhD is a challenge I set myself a long time ago. As an older person myself, I bring the personal experience of aging to this study”. The title of his dissertation is “Enhancing the Wellbeing of the Elderly in Mauritius”. Let it be known that Mauritius is a remarkably supportive country for the elderly. Some 720 associations are engaging older adults throughout the Island. (The total population for this island nation is three million.) Read full bio here. The big issue for any organization is sustainable growth and the Pass It On Network is on a full-out quest to sustain and grow the work accomplished since our launch in Paris in November 2013: a global peer-to-peer network, an expanding Internet presence, pertinent programs, and participation in international gatherings. For strategic planning, we are privileged to have been counseled by a “Kitchen Cabinet” of experienced senior entrepreneurs including: Sharon Roe Anderson, Advocate, Richard Adler, Digiplaces, Bart Alexander, Alexander Associates, Doug Dickson, Encore Boston Network, Mike Hodin, Global Coalition on Aging, Elizabeth Isele, Global Institute for Experienced Entrepreneurship, Rick Moody, Positive Aging, Brian Pratt, BSLI Redstring LLC, and Kate Snider, Floyd & Snider. We are also privileged to be expanding our Internet presence with Redstring LLC and its internet platform, Plexus. Encourage positive aging advocates to subscribe to our free newsletter, and to Join Our Community for instant video conversations, both one-to-one and one-to-many, and for free e-mailing and many other benefits. As we grow, so does our need for skilled and willing minds and hands. We are delighted to announce that our virtual team of volunteers is growing and it is our ardent hope and expectation that we will shortly find the resources to pay stipends to active contributors. We are very happy to welcome two new volunteers to our virtual, global development team – Carol Gorelick, a specialist in lifelong learning, and Carol Fleischman, a master facilitator and specialist in second-half-of-life transitions. Carol Gorelick is an inveterate learner and organizer. A native of New York, USA, Carol’s career started in information technology in the 60s, introducing personal computing and collaborative technologies to businesses, and has since spanned the entire range of learning, from organizational learning to the ecology of relationships, Her work has taken her to Africa and Europe to spread the word. Carol Gorelick is co-founder of ABC Connects, a US and South Africa education not-for-profit corporation working to strengthen schools and build communities. She also co-founded (1991) SOLUTIONS for Information & Management Services, a firm dedicated to helping teams and groups improve their performance. Carol has been an adjunct and visiting professor at Pace University’s Lubin School of Business since 1991. She is a faculty member in the Executive MBA program and has also been a visiting professor at the University of Cape Town’s Graduate School of Business in South Africa. Carol earned her BA from State University of NY-Stony Brook, her MBA from Pace University, and her doctorate from The George Washington University School of Organization and Human Studies. Carol Fleischman’s expertise is in guiding individuals, teams, and organizations to question the status quo and take action to move forward. She will be a key figure in welcoming newcomers to our Pass It On Network and will conduct regular virtual « Meet and Share » circles so that newcomers will find Pass It On pathways that match with their needs and interests. Carol has been trained by and has a 50 year affiliation with the Institute of Cultural Affairs (ICA). She has a certification and a 20-year history with the coaching program “Success Unlimited Network – SUN”. Her skills include facilitation, coaching, program development and training. She lives and works in New Orleans, Louisiana, USA where she runs her own coaching practice. During more than three decades, she has helped countless numbers of private and business clients envision and reach their goals. Provocative and profound questions asked and answered at the 6th eRegions Conference on the Silver Economy in Castle Jable, Slovenia. Read here. How do you think your country would respond to these profound questions set for a September conference panel on “Comprehensive Economic Development Solutions within the Silver eEconomy”? How much time do we have to find solutions for our aging societies? What kind of systemic solutions (regulatory, financial, technical, social) are on the table for policymakers? Are there any transnational projects devoted to this topic, using macro regional strategies? What answers do the new technologies offer, especially the digitization and ICT, in general? What sort of business models would suit all consumers, providers, and insurers? 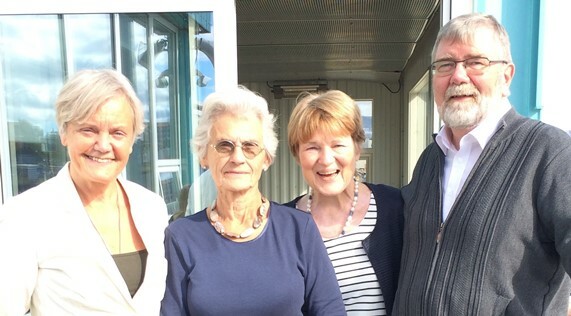 Hans-Kristjan Gudmundsson, Country Liaison for Iceland, is the co-author of an E-Book about preparing for life after retirement that is the fruit of a two-year project funded by the European Union’s “Erasmus +” program and carried out in three countries to date – Iceland, Poland and Spain. Download your complimentary copy of the just released Toward a Dynamic Third Age. The E-Book is available in English, Icelandic, Spanish and Polish. Europe was taking its rapidly changing demography seriously when it awarded support for a study project about preparing for life after retirement. In the resulting E-Book, you will discover a three-step process to prepare people approaching or entering the stage of pre- or post-retirement for a life of opportunity, progress and productivity for society. The E-Book has so gripped the imagination of the guiding body in Europe that funding has just been granted for implementing the BALL project. Dr. Rozanov, our Country Liaison, explains the relevance of Epigenetics for daily life in a brief presentation titled “Happy and Positive Aging Is Programmed in Early Childhood.” Read that article and, if you wish to learn more about Epigenetics, this article sheds new light on the issue. Good health, both physical and mental, is one of the strongest prerequisites of happy aging. Are people happy and healthy as they get older because they are doing things differently from others? or are they just plain lucky? or are there other reasons that lie in their genetic predisposition? According to Prof Vsevolod Rozanov, the rapidly developing science of epigenetics tells us that manifestation of predisposition is conditioned by environmental influences. Epigenetic marks that are imposed on our nuclear genetic material (chromatin) result from both parent effects and reactions to environmental cues. Dana Steinova and Ilango Ponnuswami, both Pass It On Network Country Liaisons, for the Czech Republic and India respectively, worked together to do something in the field of memory training that’s never been done before in India. An intensive one-week certification course was organized jointly by the Department of Social Work at the Bharathidasan University in Tiruchirappalli, EURAG’s Memory Training Center in Prague, and the Czech Society for Memory Training and Brain Jogging, supported by the Heritage Foundation Hyderabad in the Indian state of Tamil Nadu, where Ilango is a Professor of Social Work. Ilango reports that the training was extremely beneficial for over 75 participants who included social work students and Ph.D. scholars in the Department of Social Work and community practitioners plus about 20 students and Ph.D. scholars from the Department of Educational Technology at the Bharathidasan University. Participants were trained in specific memory techniques like mnemonics, techniques for improvement of spatial orientation, and very interesting and stimulating exercises for the less dominant hemisphere of the brain. The participants acquired skills required for training elderly and other target groups. The course content included Prof. Pavel Kalvach’s presentation on the structure and functioning of the human brain, adding value to the overall training course. Mohan Rajan, one of the graduates, said, “I am planning to hold a session for a small group of elderly people on October 1, the ‘International day of Older Persons”. Another graduate, Juliet C.J., thanked Dana for “meticulously equipping us with many useful skills,” and Pavel for “enlightening us about the mechanisms of brain.” She teaches in the School of Social Work at Roshni Nilaya, Mangalore, a college that is close to agencies working with the elderly such as Vishwas Trust that has day care centres for the elderly and is developing a “Golden Age Village”. Dr Jan Hively, Pass It On Network’s Co-Founder and Country Liaison for the USA, will fly to Moscow in October to present a keynote at the Fourth Society for All Ages National Conference in Moscow on October 6 and 7, 2016. The conference has been organized by Dr. Gulnara Minnigaleeva, Country Liaison for Russia. Professor Vsevelod Romanov, Country Liaison for Ukraine, will also present a keynote at the conference. The general theme is “Culture of Old Age,” from living environment, social ties and cultural traditions to the perception of old age in our society, and attitudes of the elderly about themselves. EURAG’s bi-annual council meeting was held in Bratislava, capital of Slovakia, which is currently holding the Presidency of the Council of the European Union. Each Member State holds the Presidency for six months on a rotating basis. During that period, the country holding the Presidency chairs meetings at all levels within the Council and is thus responsible for shaping European legislation from expert to ministerial level. One of the principles of the Slovakian presidency is to restore citizens’ confidence in the common European project. Mr Jan Lipiansky, president of the Slovak pensioners union, welcomed members and stressed the importance of using the opportunity Slovakia has at present to pursue the promotion of international co-operation and solidarity of seniors in EU countries for social housing and to continue negotiations to establish a European “senior pass” to provide discount benefits in many areas of daily life. 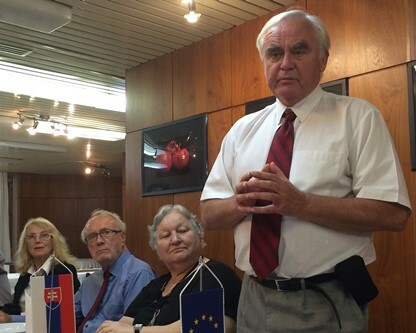 Next to him (l to r) Dana Steinova, EURAG’s secretary genera, Peter Hansen, representing a new member organization from Denmark, and Dr Maria Chaloupkova from Slovakia. Perica Vucemilovic, lifeblood of the Croatian Centar HALO za POMOĆ, whose main program is a 24/365 Social TeleCare Service for elderly and disabled persons living alone. 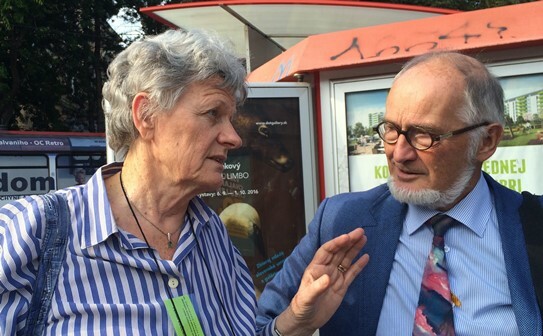 She is in conversation with Jaap van der Spek, chairman of NVOG, the Netherlands society of organizations of retired people. Her problem is that she is way past her retirement age and has no one to willing to continue the valuable work she started in 2002. Operators of the centre have saved the lives of vulnerable users hundreds of times. 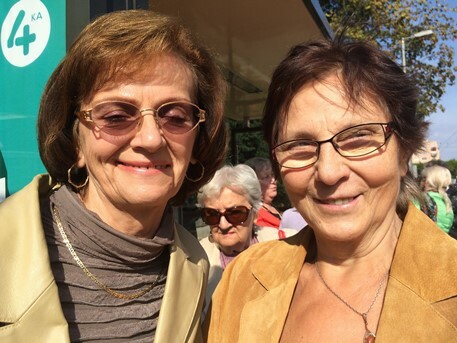 Dr Aneta Zubekova, who has wide experience with the European Union, (left) and Mrs Maria Trencikova, who runs the EURAG Memory Centre in Bratislava, were members of the Slovakian hosting team. Peter Hansen, from Denmark, Dirk Jarré, President of EURAG (center) and Dana Steinova, EURAGs Secretary general. AGE Platform Europe now has a new website that can be accessed at the same address: http://www.age-platform.eu. It is dynamic, brighter and very user-friendly. A FACIL’iti button, located on the upper right side of the home page, will improve further the readability for persons with age-related impairments. The International Institute on Ageing (United Nations – Malta) has just launched a new peer-reviewed journal entitled International Journal on Ageing in Developing Countries. Evolving from its former newsletter, BOLD, it will be governed by a new ethos to strengthen the Institute’s information exchange directive. In his editorial, INIA’s Director, Marvin Formosa, explains the reason for launching a new journal in this field. “There are other journals concerned with ageing, older persons, and later life, which sometimes publish articles focusing on gerontological and geriatric concerns in developing countries. However, INIA does not believe that the presence of these journals has filled the gap when it comes to our knowledge about building human capacity in low-income countries and other nations with economies-in-transition. It is evident that a journal that combines the unique critical blend of research, scholarship, policy, and practice concerning developing countries – a blend to which the International Journal on Ageing in Developing Countries clearly aspires – is in rare supply. Nor do available journals focus on the emergent inter- and multi-disciplinary issues, as well as evidence-based practices, in the field of ageing in far-afield developing countries that generally fly under the radar.” Review the new journal.